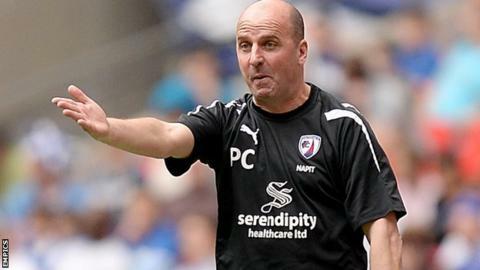 Chesterfield boss Paul Cook is "disgusted" by the Football Association decision to order a replay of the FA Cup tie between his side and MK Dons. The Spireites' on-loan defender Georg Margreitter was ineligible for the 1-0 win at Stadium MK and they must replay the second-round tie on 2 January. Dons boss Karl Robinson has previously called the decision "not right". "I just think it is disgusting for everyone involved. It's a waste of time," Cook told BBC Radio Sheffield. "Our fans travelled in great numbers. If we broke the rules, then we should be chucked out, and if we didn't, then we should be through to face Scunthorpe. Nobody deserves to face a replay." Austrian central defender Margreitter, 26, has since returned to parent club Wolves following the end of his loan spell. The Spireites revealed on Thursday that they would be subsidising travel and tickets for fans who wish to attend the replay against their League One rivals in Milton Keynes. The winners will be away at fellow League One side Scunthorpe in the third round.